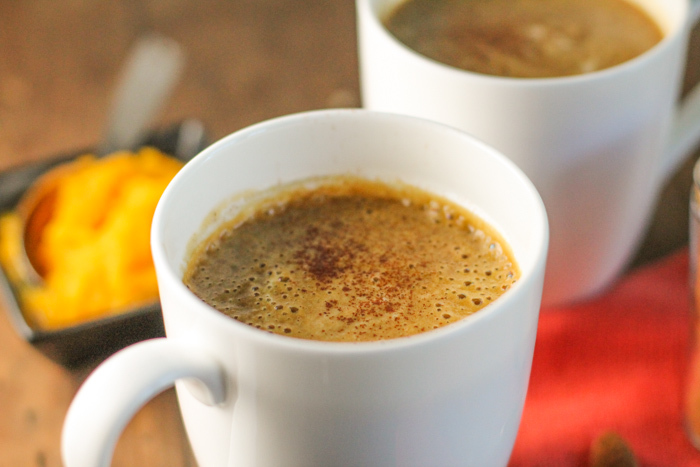 This pumpkin bulletproof coffee makes a great breakfast or afternoon snack. Cooler weather is here, and all variety of pumpkin coffee drinks are available. How about making your own version to avoid a major sugar crash and load up on some amazingly healthy foods while your at it?! Why Can Bulletproof Coffee Be A Good Idea? I remember when this concept came out years ago….and it sounded sooooo……well….strange. Butter in coffee? But why?! I quickly figured out, a bulletproof coffee satiated me sufficiently instead of breakfast…which was awesome! And starting your day off with super healthy fats signals to the body to kick start that metabolism! Here is great article about the reasons bulletproof coffee could be a good idea for you too! Why Is MCT Oil Good For You? An instant source of energy for your body and brain, MCT is a healthy fat that should be in your diet! With all the potential health benefits listed below, I rely on MCT to help me feel full longer, keep my brain going in the afternoon, and for an extra energy boost for long workouts. Why Should I Use Collagen? Improves skin, hair and nails. When I regularly consume it, my nails go from flimsy to rock hard…no joke. Since it helps form connective tissue, it is awesome for people with leaky gut! It helps repair the intestinal lining! Without a doubt, Perfect Supplements is my favorite brand! Use code Tessa10 to get 10% off ANY order! I have recently discovered one of THE best ways to make a cup of coffee!! I especially love that I can pull it out and use it to make a single cup and not mess with a coffee pot! The AeroPress is super popular for reason, and if you are a coffee lover, it is very worth checking out! One of the smoothest cups of coffee you will ever enjoy! 1.5 tablespoons erythritol or any sweetener, to taste (this is very personal! In a small saucepan over medium low heat, simmer the "simmer pot" ingredients to heat through and dissolve sweetener. Place the coffee, collagen, MCT, butter, and all the hot simmered ingredients in the blender. Blend on high until a bit frothy and well mixed, serve immediately. Making your own lattes is soooo much tastier! Looks awesome. 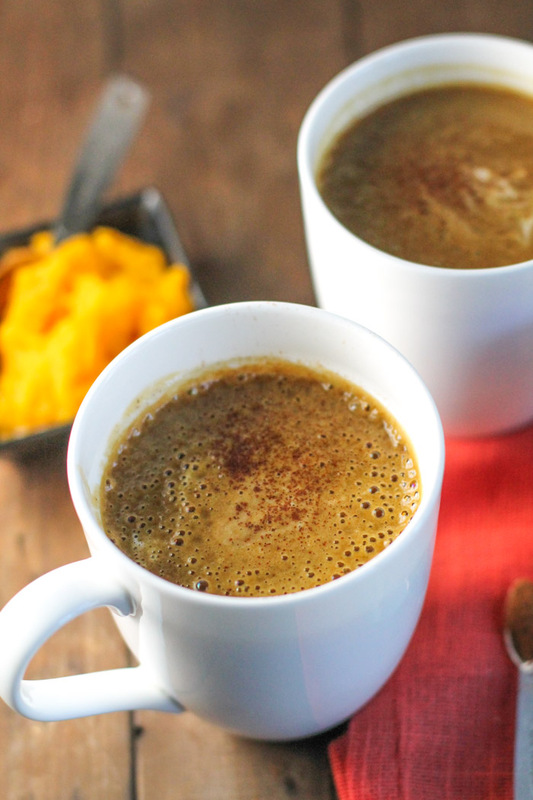 The weather is getting colder so this healthy hot beverage will be perfect ! I adore pumpkin anything so I’ll be trying this recipe next week. Sounds and looks delish! Thanks for sharing. Thanks for sharing your recipe. I’ve pinned it! 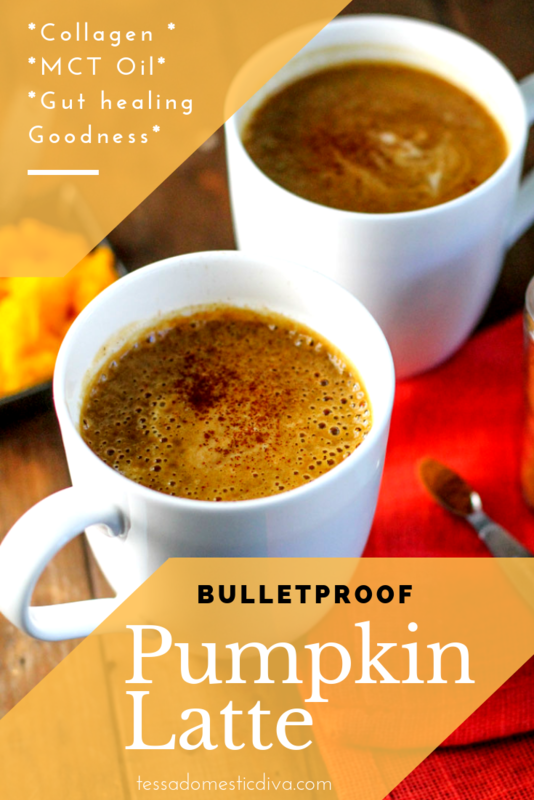 I love the idea of a pumpkin bulletproof latte!!! I pinned this and can’t wait to try it! I want to try this! Looks and sounds SO tasty and good for me! I have MCT oil on my list to source locally or I will use your link/suggestion. Wow this is incredible, and so much better than anything you could get at a coffee shop! I bet coffee and pumpkin tastes amazing together. I love this recipe! It’s so perfect for fall and winter. Totally making it! So much gut healing goodness in here. This may become my new afternoon snack to give me a boost to get through the rest of the day! This is definitely goin’ down in my kitchen. I’m all about the who-needs-starbucks drinks! 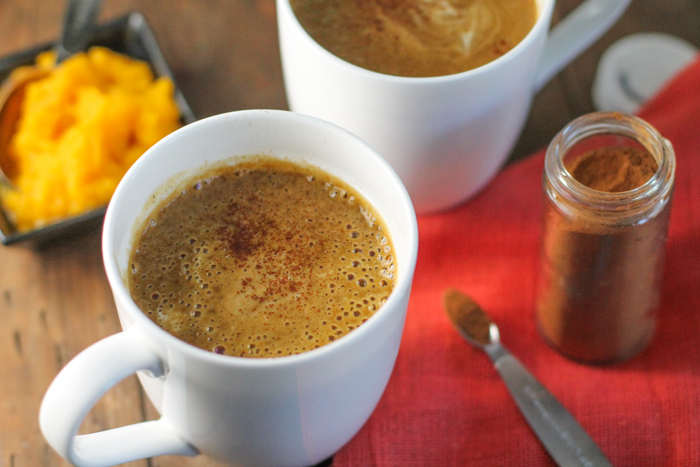 Omg of course we all need to add pumpkin to our coffee! And MCT oil, I love this! LOVE everything about this, especially the MCT oil and collagen! It’s like a meal in a cup! Oh man, this sounds so good! I am not a coffee drinker, but I can smell the fall from the pumpkin and warm spices. This hot, creamy mug looks so special! And I love the sea salt you included!! I loooove bulletproof coffee, and with pumpkin?? I’m all about this. Super fun – what a special drink to enjoy this time of year! I have made a few pumpkin spice lattes with butter and I don’t think I’ll ever go back! Love all of the seasonings for the pumpkin spice flavor, so yummy! Such a great idea that you made this bulletproof too, can’t go wrong with that good for you fat and collagen.